Union Leader Confronts Race Issue In Campaign A top labor leader is making an unusually blunt pitch to working-class white voters in key battleground states. 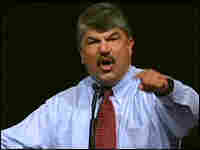 Richard Trumka, secretary-treasurer of the AFL-CIO, urges members to ignore race and vote for Barack Obama. 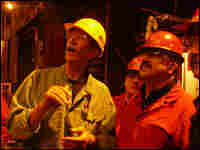 Union leader Richard Trumka (right) stopped by this steel mill in Ohio on Oct. 9 to urge its workers to vote for Barack Obama. 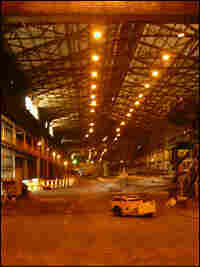 At steel mills and warehouses like this one, union leader Richard Trumka asks fellow workers to vote Democratic on Nov. 4 and set aside any prejudices they may have about voting for an African-American candidate. A top U.S. labor leader is making an unusually blunt pitch to working-class white voters in key battleground states. Longtime United Mine Workers President Richard Trumka, who is now secretary-treasurer of the AFL-CIO, is making the case for Sen. Barack Obama. For the past several months, Trumka, 59, has been giving speeches on the issue of race and the presidential election. It's a reaction to racist comments he has personally encountered. In an interview, he said he felt compelled to personally challenge anyone in the labor movement who may not vote for Obama because he is black. Obama's status as the first African-American ever to win a major party presidential nomination means race has taken on a prominent role this year. That said, it's still rare to hear the topic confronted quite so directly as Trumka has. In a speech before the national convention of the United Steelworkers in Las Vegas in July, an emotional Trumka said, "We can't tap dance around the fact that there are a lot of white folks out there" — a lot of them are good union people, he added — who "just can't get past this idea that there's something wrong with voting for a black man." In the speech, Trumka went on to say that while there are many reasons to vote for Obama, there's "only one really, really bad reason to vote against Barack Obama. And that's because he's not white." A recording of that speech has been widely circulated, thanks to YouTube. Since then, Trumka has repeated it at union halls around the country. Trumka is white. Asked why he is giving this speech, he told the story of a conversation he had the day of the Pennsylvania primary in his hometown of Nemacolin in the southwest corner of the state. "This woman walks up to me. I'd known her for a long time, and I ask her 'Have you decided who you gonna vote for?' "
"There's no way I'd ever vote for Barack Obama," the woman responded. Trumka said he pressed her as to why. First, she said it's because Obama is "a Muslim." Trumka responded that Obama is actually a Christian. Then, she told him Obama never wears an American flag pin on his lapel. Trumka told her that, too, is false, then asked her why she wasn't wearing one if that is such an important issue. Trumka said he continued to push, until "her eyes dropped down and she said to me, 'Well, he's a black man.' "
Trumka said he told her to look around at their town, the mining community where they both had lived for so long. "And I said to her, 'This town is dying — literally dying.' "
It's a line that he includes, verbatim, whenever he delivers his speech. "Our kids are moving away because there's no future here," Trumka said in the United Steelworkers convention address. "And here's a man, Barack Obama, who's going to fight for people like us, and you won't vote for him because of the color of his skin? Are you out of your ever-loving mind?" Confronting this, Trumka said, is labor's responsibility "because we know, better than anyone else, how racism is used to divide working people." Trumka pointed out that this is hardly new territory for the labor movement. In the 1960s, United Auto Workers President Walter Reuther and others in organized labor marched with the Rev. Martin Luther King Jr. Trumka also pointed out that labor was deeply involved, through boycotts and educational activity, in the effort to end the era of apartheid in South Africa. In Cleveland, Trumka stopped by a hulking steel mill not far from the union hall. The plant was down while undergoing regular repairs and maintenance of the giant machines that roll out hot sheets of steel. The plant visitor dropped into the lunchroom, better known as the "fishbowl" in the parlance of the mill. After a brief pitch for votes for Obama, there was time for some questions before the lunch hour ended. On this day, the topic of race did not come up. It doesn't come up every time Trumka speaks to a group of workers. This time he was asked why the union isn't supporting Republican John McCain, since the husband of Sarah Palin is a member of the Steelworkers Union in Alaska. Trumka had a ready reply: "McCain and all of his policies are bad for us." But the questioner, 50-year-old Dave Moeller, persisted, switching to another topic: abortion. He said Obama, a supporter of abortion rights, wants to keep babies from being born. Trumka disagreed with the characterization. Then Moeller switched topics again, to an issue near and dear to many blue-collar Americans. "We don't need our guns taken away, either, but he [Obama] wants to do that," Moeller said. Trumka shot back, "That's not true. That's absolutely not true. He believes in the Second Amendment. He has a better position than John McCain." Then, to bolster his credibility on the topic, Trumka added, "And by the way, I'm a sportsman." After a few minutes of that, everyone shook hands. Trumka headed outside. He said such encounters are valuable, whether the discussion is guns or something like abortion, which also comes up frequently — or Obama's race. "Personally, I enjoy that kind of stuff," Trumka said. "I mean, you never get a chance to find out what's on people's mind if they don't talk to you. So those kind of interchanges are really helpful. And it's actually what it's all about." From there, Trumka headed to a union-operated phone bank at the United Food and Commercial Workers local on Euclid Avenue in downtown Cleveland. About a dozen volunteers called union members to encourage them to vote for Obama. Among those at the union hall was Graylon Keeton, a Cleveland municipal worker and member of the Amalgamated Transit Union Local 28. The 58-year-old Keeton, who is African-American, walked up to Trumka and thanked him for the speech he has been giving to union audiences. "I've got a copy of it at my house," he told Trumka. Keeton says Trumka is doing a great thing this election. Race, Keeton says, "is the big elephant in the room. It's there, but nobody wants to see it. But you have to."